If you've missed the opportunity to experience the resident and famous NYSDEC biologist, Ed Reed's presentations on Adirondack fauna, then you are in for a treat. Ed will be speaking this Wednesday evening at 7:30 p.m. at the Paul Smiths Visitors Interpretive Center. Co-hosted by the Forest Preserve Education Partnership, the lecture, Moose & Bear: Adirondack Charismatic Megafauna, will provide information on black bear and moose, their natural history, population, biology and habits. As the well-informed readers of this blog know, the Adirondacks are home to the largest population of black bear in New York State, and some bears have become a bit annoying. Ed will talk about the management of bear populations and how to avoid attracting and creating "nuisance bears." He will remind all of us that humans create problem bears. Ed will also share photos and anecdotes of his first-hand experiences and second-hand stories accumulated over his many years of capturing, chasing, harassing and researching bears in the Adirondacks. A very popular part of Ed's lectures, and sure to be a hit this week, concerns the return of moose to the Adirondacks. The past decade has seen New York's moose population grow as a result of the birth of calves, rather than migration from Vermont or Canada. It is a little known fact however, that after a 100-year absence; sometime in the 1970s, some moose swam across Lake Champlain to New York from Vermont and decided to stay. Or they were too tired to swim back home. 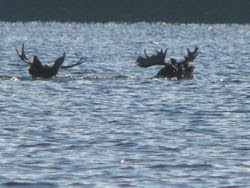 One of Ed-the-biologist's favorite topics to discuss is why moose swim so well. I've always wondered if it is because they have webbed feet. I will give a Candy Man Moose Lollipop to the first person attending the lecture who asks Ed if moose have webbed feet. In any case, as the resident biologist and moose expert has noted, moose in the Adirondacks are fun to see and their population is presently on the verge of a sharp increase. Stop by the VIC this Wednesday evening to learn about these two iconic Adirondack wildlife species.